I spent the day helping my mom make bread. We make it just as we did when we lived in Calabria; in fact, my mother brought the starter from Calabria in her purse when we moved to California! 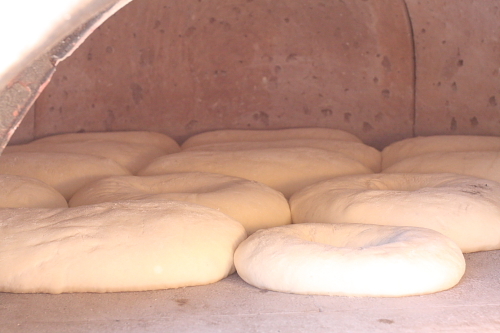 In Calabria my mother would make a large amount of bread, as much as 40 pounds, to last for a couple of weeks. Nowadays she kneads only 25 pounds of flour at a time, all still by hand. (That's one reason why at 75 she still has great arms.) We eat some immediately, and freeze the rest. This lasts for a couple of weeks for both of our families. We always save a small amount of bread dough from the previous batch in the refrigerator. So the night before we bake, my mom refreshes this "starter" by adding some flour and warm water to it. 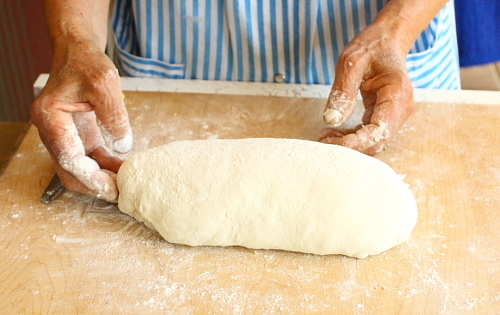 The dough is then shaped in either a long loaf (filone), a round (panetta) or a ring (cudduredda). The bread is then allowed to rise for a second time for a couple of hours under warm blankets. During the winter months and rainy days we bake the bread in my kitchen oven, but in spring and summer we bake it in my wood-burning oven on my deck. I have a Mugnaini oven imported from Italy and I use it to bake pizza and bread, as well as to roast food. Once the oven is at the right temperature we shove the loaves inside with a pala, each loaf laid right next to the other. The loaves bake for about an hour. And here's the finished product! 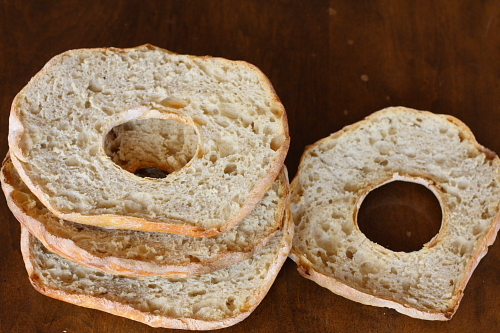 Some of the flat, ring-shaped loaves (see those in the front of the picture above) will be horizontally split in two after the first bake, and then are baked again at low temperature until they are fully dried. These are Calabrian rusks, called friselle, and meant for long keeping. Unfortunately they never stay for long in my home as it is my kids' favorite snack. They love to eat friselle by just softening them with a little water and topping it with olive oil, oregano and garlic. During the summer I love them topped with chopped fresh tomatoes, basil, garlic and olive oil. 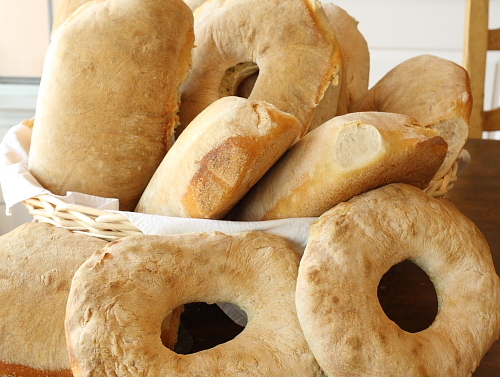 Our Calabrian bread is sturdy, with a tight crumb, and faintly sour from the starter. The detailed recipe for making our bread will be in my upcoming cookbook, My Calabria, to be published in 2010.